Nov. 5, 1912, was a bad day for Wisconsin women hoping to gain the vote in a statewide referendum. Wisconsin voters (all male, by definition) shot down the suffrage question. 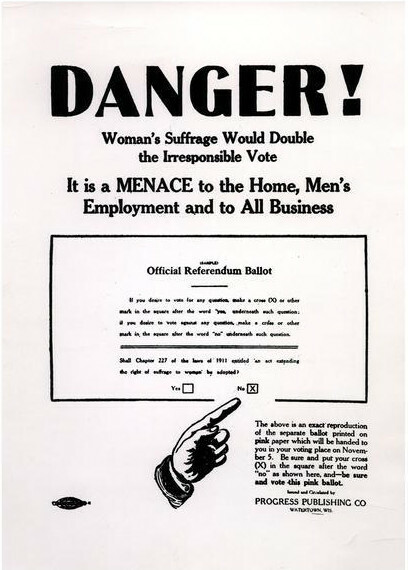 As the poster, pictured right suggests, many of them did so for fear of what women would do armed with the vote. (Since only men could vote, it’s not clear who the other half of the “menace” in question is). Women’s rights groups began forming in Wisconsin in the late 1860s. Most focused primarily on suffrage and temperance, the latter of which generated particularly strong opposition from the state’s powerful brewing industry, as well as German-Americans. Many of these voters believed that enfranchised women would force prohibition on the state. In 1911, Richland Center suffragist Ada James enlisted her father, state Sen. David James, to push for a statewide referendum on suffrage. His support along with the lobbying of the Wisconsin Federation of Women’s Clubs brought the issue to voters in the fall of 1912. Wisconsin men voted suffrage down by a margin of 63 to 37 percent. Many factors contributed to the referendum’s defeat, but the link between suffrage and temperance played a major role. Seven years later, in 1919, Wisconsin became the first state to ratify the 19th Amendment, the measure that would give women the vote nationwide. It was Ada James’ father, David, who raced to Washington, D.C., after the state Legislature approved the amendment to give Wisconsin that honor.